A quick story: I tried to get my wife to come see Ain’t Them Bodies Saints with me last weekend, but she opted out. When I asked her why, she said she was put off by the name. For me, that’s no reason to dismiss a movie, but she has a near-perfect track record of predicting which movies she will like or dislike. In this case, I’m sure she was right, as the title of the movie – lyrical, intriguing, and its meaning just out of reach – perfectly represents the film. Writer/director David Lowery’s minimalist classic reminded me of another great film released this year: Shane Carruth’s Upstream Color, which Lowery edited. Both films have the same unusual narrative style. They leave out the scenes other movies would require – exposition and action sequences, mostly. Instead, Lowery gives us enough to follow the plot but prefers to show us only those scenes that convey his themes. Flying in the face of conventional narrative technique, Bodies is a challenging film but one that mostly rewards your patience. The unusual narrative style is even more jarring here than it was in Upstream Color because genre movies stick pretty close to their conventions. Bodies is a western, of sorts, and also another entry in the always-popular “lovers on the run” genre. 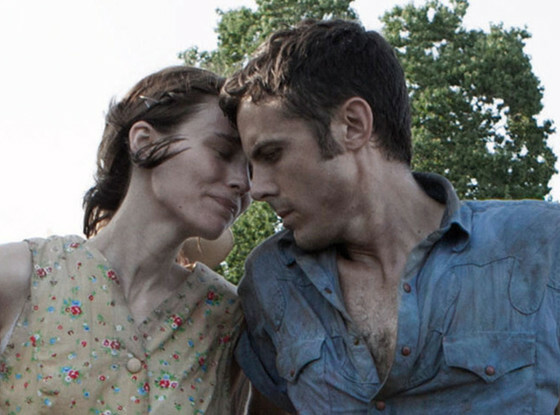 In West Texas, Bob (Casey Affleck) and Ruth (Rooney Mara) are young, volatile lovers, the type that make love and fight with equal enthusiasm. Like characters in a Terence Malick film, they have made a small heaven in their rural, meager existence, but Hell is coming. Ruth is pregnant, and Bob pays the bills with a life of crime. After a job gone wrong leaves Bob in jail, a local cop starts looking after Ruth and her daughter. Meanwhile, Bob breaks out of prison and seek to re-join his family, a situation that, if the genre has told us anything, can only end in tragedy. The story remains well-worn territory, to some degree. Lowery never completely subverts his genres, but the film still feels unique because he leaves out the scenes we’re accustomed to seeing in those genres. We never learn what the job was that leads the cops to Bob’s door. There is no thrilling action sequence that shows Bob escaping from prison. And the cop never has professes his love to Ruth; instead, he just keeps showing up in her life until, one evening, they fall asleep on the couch together. For Lowery, this is an act of tremendous faith in his audience. Besides trusting that his audience will be comfortable without these genre conventions, he also eschews any social, political, or even historical context that could help us connect to the story. The title card tells us only that “[t]his happened in Texas,” but Lowery intentionally avoids placing the story in any particular time. There are plenty of old cars in town, but that could signify a setting in the past or just a town that has never reaped the rewards of economic progress. I can’t help but feel that Lowery could have avoided this problem altogether by creating a more original story, but he makes the most of what he has. Instead of reaching out to the viewer through relatable cultural details or genre conventions, Lowery leaves things almost entirely in the hands of his capable actors. Affleck is most well-suited to the material, as his minimalist acting style also seems to be leaving out key character elements. He can play a regular guy when called upon (Ocean’s Eleven, Gone Baby Gone), but he makes more of an impression playing criminals (The Assassination of Jesse James by the Coward Robert Ford) and sociopaths (The Killer Inside Me) who have a little something missing. His youthful appearance and high, lilting voice make him seem like an overgrown child, the last guy you want with a loaded gun in his hand. Rooney Mara and Ben Foster have a bit less to chew on – their roles are less ambiguous – but they both make compelling screen presences. Mara is an unconventional choice for the role of poor, single mother in rural America; she has been utilized more often in modern, heavily stylistic films like The Girl with the Dragon Tattoo and Side Effects. But she has a strong, steady presence here. Foster’s role is also a change of pace. He played a wild outlaw in 3:10 to Yuma, but here he gives subtle shadings to a simplistic character. In fact, that’s the movie in a nutshell. There is no single element here that will make you sit up and take notice – except the gorgeous, natural cinematography which has rightly also been compared to Malick’s work – but it adds up to a stirring, consistently-drawn whole. Most of all, it is Lowery’s narrative style that stayed with me long after the movie ended. It is a new way of telling an old story, and that alone is worth the price of admission.